This past weekend, the Professional & Amateur Pinball Association (or PAPA) hosted the world championships of pinball, bringing flipperheads together under one roof to compete on classic machines for the top score and prize. It was a fantastic display of pinball wizardry, marred only by an incomprehensible production set-up. Twelve different machines stood as the accepted pantheon of tables, hailing from different eras and time periods. The ’80s-era Skateball and gorgeous ’70s setup The Jungle Queen stood alongside more modern pinball machines like World Poker Tour and The Walking Dead. Players had several attempts to set their highest score, which was then converted into a rating from 0-100 for how well they played. It was essentially formatted like the X Games, with different runs happening at the same time and lots of games being played. 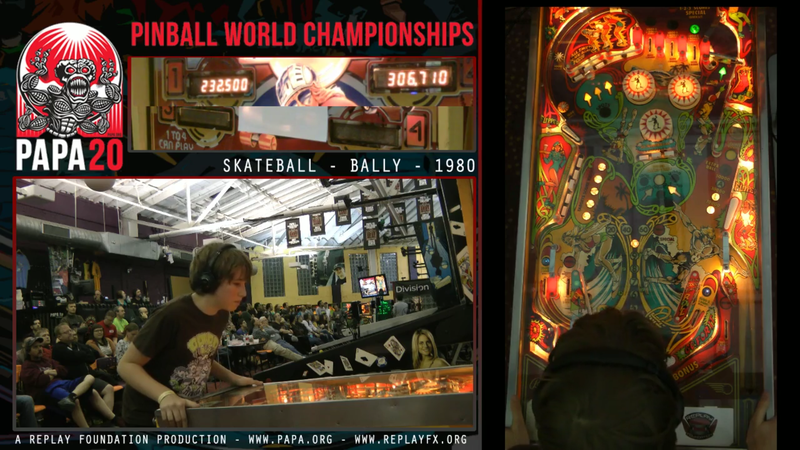 Escher Lefkoff, a 13-year-old pinball prodigy hailing from Colorado, won the Division A title (plus $7000 in prize money) and now stands as the World Champion; below, you can see a great run of his at Skateball that capped off the end of the stream. The stories told here are incredible, and the strategies and mechanics of competitive pinball are surprisingly complex. This makes it a shame that the production set-up didn’t carry the weight these championships held. A lack of stream overlays, brackets, or even discernible results marred the overall presentation. Commentators rarely formally announced the name of competitors, much less which division they were competing in or what the consequences would be of a good or bad run on the table-at-hand. Cameras covered the angles well (love the overhead shot! ), but the lack of actual pinball noises felt a little strange. Even just a shotgun mic next to the machine itself, trying to capture some of those mechanical sounds and ringing bells would have elevated the experience—pinball flippers have a nostalgic aural feedback, like the crack of a bat or the swish of a net, and that’s crucial to getting a stream audience hooked. A 13-year-old competitor won the world championship, and an eight-year-old kid (seriously) won the D division for amateurs, but I had to go to a separate forum to find that information. Pinball is something ingrained in our minds; everyone has at one point or another played it. One can inherently understand the skilled display of a player putting up eight or nine-digit scores, juggling multi-balls, and avoiding that dreaded corner tunnel to the gutter. Hopefully next year, the production can match the heart of it, as then-14-year-old champion Lefkoff competes against the Tommys of the world.